The museum displays nearly 400 works of art, artifacts, photos, documents, various types of embroidered pictures, double-sided embroidered pictures, thread sculptures and other relevant artifacts. Most of the embroidery works are doubled sided, still life, landscape, portrait, flower, and philosophy pictures. They tell stories about the history of the embroidery craft, the preservation and promotion of the craft, and the beauty and talent of Hue women. 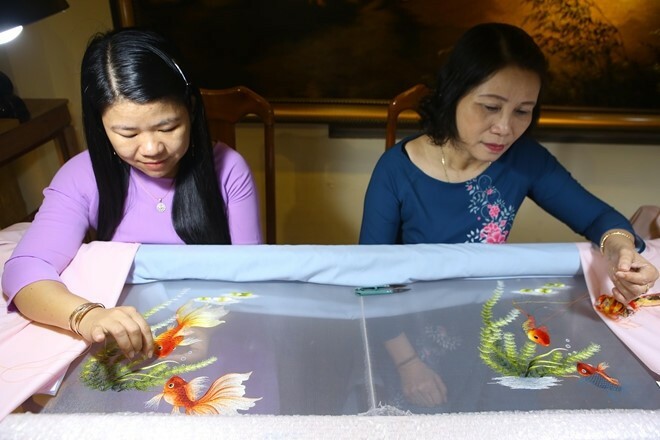 In the early 1990s, artisans Vo Van Quan and his wife Hoang Le Xuan were the pioneers for a breakthrough in Vietnamese silk paintings, by combining painting and the embroidery arts. The establishment of the XQ Embroidery Art Museum reflects their passion for embroidery. The museum has become a tourist attraction in Hue ancient city.